This week I had the privilege of being featured on my good friend Anton Strout’s “The Once and Future Podcast.” We got very writerly in our discussion — folks looking to hear about the struggles of writing life…and writing sequels…and writing under stress…and writing while over committed…will LOVE this one. 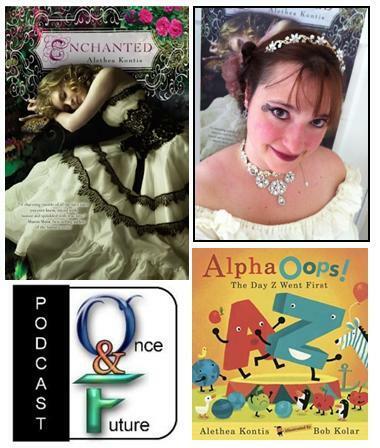 This week I talk with author Alethea Kontis about her latest young adult book Enchanted, Alpha-Oops!, Dragon Con, fangirlism, Mad Scientist Garden Gnomes, fairy tales, how we hate THE MUSE, and just how hard it is out there for Disney’s lost princess! This entry was written by Princess Alethea and posted on June 20, 2012 at 10:31 pm and filed under audio, Books, Enchanted, Friends, Podcast, writing. Bookmark the permalink. Follow any comments here with the RSS feed for this post.